Orkney Image Library - Mystery football team? Do not know anything about this photo, it was a postcard my father found in his loft. Does anyone know? If the estimated date is anywhere near correct, none of these people can be alive today. It's presumably a Salvation Army sponsored team, well photographed (in a more genteel setting than is usual nowadays; the dirt at top left is on the photo, not the boys). I can't make out much detail in the emblem on the strip. It's probably a version of the 'official' SA badge or crest. Salvation Army people might know? Third from the left middle row is my late brother Robin Bain. I think this photo might be from the early 1930's. Comparing the photo to photo# 2246 the boy in the middle of the front row looks like he could be John Donaldson. 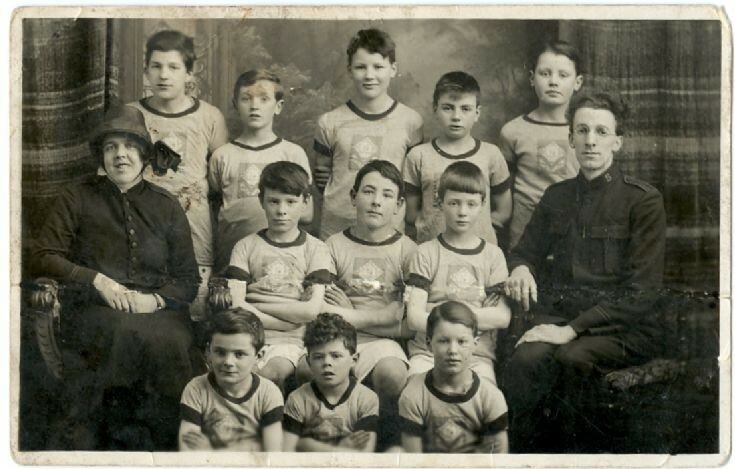 Comparing with picture #7909, dated 1930: there is a strong resemblance between the boy front & centre, above, and the lad identified as possibly John Donaldson in #7909. But there's only a year or two difference in age between the two, judging by appearances, which would date the above photo to about 1928. I must say it has a much older 'feel' to it. Could one lad be, say, the father, or other close relative, of the other? This photo does look older right enough, maybe that's down to it being taken in a studio. The date on picture #7909 is an estimate and I would think it is actually from nearer the mid thirties. I'm basing that estimate on the fact that picture #2246 was taken in 1932. Can you put a rough date on it Liz? I'll try Bruce.If my brother was alive he would be age 91 or 92.I think he would have been maybe 7 or 8 in the photo.So 1928 or 1929.